Good to Go is a five reel online slot game that has nine pay lines. The slot game was developed by Microgaming and is one of their newer type of nine reel online slots with a variety of bonus features. Good to Go centres on a motor racing Formula 1 type of theme and features graphics, animations and sound effects that are all based on racing action. Some of the higher valued regular symbols include a race car; a helmet; a checked flag and a licence plate. These symbols award anything from 1 000 coins to 2 500 coins for five in a row on an active pay line. A racing car wheel pays out up to 500 coins while the number and letter icons including seven; eight; nine; ten; jack; queen; king and ace pay out anything up to 500 coins. Up to ten coins can be bet on each of the nine Good to Go pay lines. The coins can however be set at values of 0.01; 0.02; 0.05; 0.10; 0.20; 0.25; 0.50 and 1.00. Bets can be placed using the function buttons found below the reels which includes a max bet button to automatically place the highest possible amount. After any winning combination lands the gamble feature may be activated where the winning amount can be gambled with. The amount can be doubled up by correctly guessing whether a playing card that is to be revealed will be red or black in colour. An incorrect guess results in the entire amount gambled being lost. The Good to Go wild symbol is represented by the one displaying the blonde pit girl. She functions as a substitute for any of the symbols to help form winning combinations but she will not act as a substitute for a scatter symbol. This symbol is also the highest earning symbol and will award the top jackpot of 5 000 coins for five in a row on an active pay line. 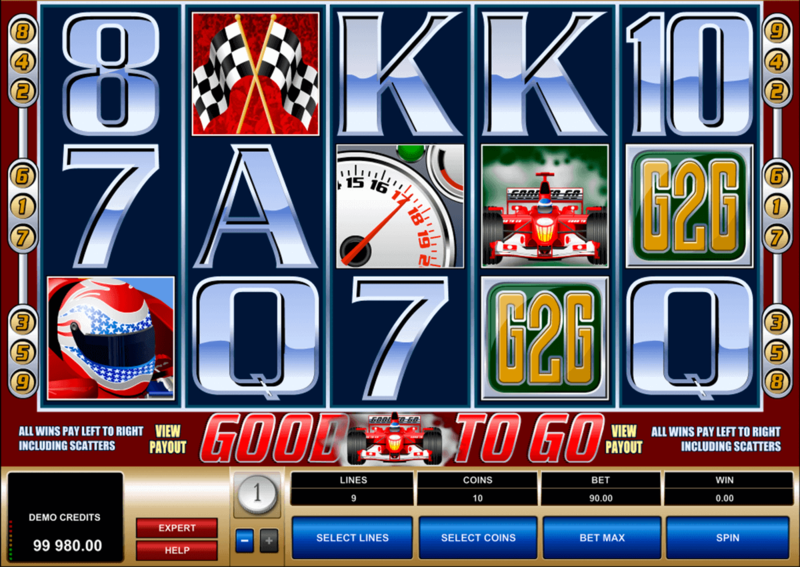 The Good to Go online slot scatter symbol is the symbol displaying the rev counter. The scatter symbols pay out when two or more land consecutively on an active pay line running from both left and right but three or more of them on the reels will also activate the free spins bonus round. Five of the scatter symbols pay out up to 50x the total bet amount. When the Good to Go online pokies NZ free spins bonus round is activated three free spins are awarded. While the free spins play out the reels that hold the scatter symbols that initially activated the feature are held in position. Any more scatter symbols appearing will be held in place which may re-activate the free spins feature, making this a super exciting for players seeking a different change of scene to the regular online betting NZ has to offer. Scatter symbol wins during this round can pay for any position and do not need to be lined up left to right or vice versa. Scatter wins involving five scatter symbols will pay out 50x for each free spin.